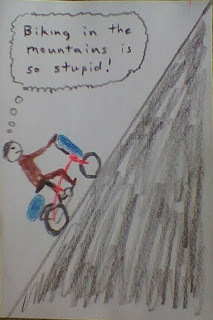 As I write this some people have already finished the 2011 Tour Divide. Others are still out there racing along those awe inspiring miles between Banff Alberta and Antelope Wells New Mexico. As is the case every year, many riders have been unable to complete the full distance for a variety of reasons. Each rider's effort is sincere, each journey difficult and filled with sacrifice. The race is hard, harder than anyone whose never ridden it can ever imagine, and beautiful, more beautiful than any words or photographs can ever capture. Each year is unique, with weather and the world making the challenge of the moment something each racer must face as a great personal test. Holy crap some of those guys are fast! My god some of the conditions this year are horrible! Justin Simoni is one brave, smart, stylish, tough dude. See the picture at the top of this page? Picture it covered with snow. That's the ridge along the edge of Richmond Peak, and I'm pretty sure that's about the spot where Justin and his bike tumbled down the mountain. BTW, it's steeper than it looks in the picture. Justin climbed back up and carried on. Several days later when he climbed Union Pass to find that the top of the mountain was a dazzling white undifferentiated snow, he wisely retreated to get better maps and some sunglasses. And then he went back up and over, barely paused at Pinedale and pushed on into the Basin. Sitting here in the world where hot coffee is at my fingertips and my main effort is clicking a mouse to refresh a screen filled with blue dots, I can only say "Well played, Mr. Simoni, well played!" I would like to say a bit about technology and the Tour Divide, not to judge it as good or bad, but to point out how it has changed the race over time. 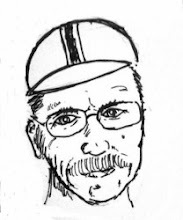 In 2005, when I race the Great Divide, it was a small field of racers (seven of us started). We called in from payphones, we navigated from paper maps and very few people we met on the route had any idea that we were racing. When I raced the Tour Divide last year we all were tracked via satellite and people I'd never met would greet me by name. When I'd go off course in 2005 I'd just think "Damn, I'd better find my way back" but when I'd go off course in 2010 (some things never change!) I'd think "Damn, I'd better find my way back because I know Christine is at home looking at my SPOT dot and freaking out." It was harder to call in from payphones in 2010 because payphones are disappearing from the world. GPS may guide us perfectly and while the fast folks wisely use them, some, like Justin and myself, go out in the world to find a place where we don't spend the day staring at a screen. That doesn't make us better and it may make us slower but it's a choice some find worthwhile. Technology has changed the Tour, as has its fame. 70 riders eat more Snickers bars than 7 so if you're a back of the pack rider in 2011 you may find emptier shelves at the mini-mart you were counting on. And the conversation with the clerk may be less of a "what the hell are you doing?" and more of a "so and so was here 4 hours ago and there is this weather coming from the east and let me show you the position of the other racers on my iPhone." Again, not good or bad, but different. Racers can and do update their Twitter feeds and Facebook pages. The stories unfold in real time. In the next year or two remote drone cameras on mini-RC helicopters will be cheap enough that people will use them to shoot video of events like this and we'll be watching live feeds of racers struggling over snowy passes or sprinting the last long dry miles to Antelope Wells. The drama will still be in the miles, muscles and minds of the racers and in the wild weather and the harsh landscape. But the front row seats are getting ever closer and the land out there doesn't seem quite as distant as it once was. I keep saying this isn't good or bad, it's just different. We've gained a lot with our SPOT dots and GPS and cell phones, but I think we've lost something too. I can be thrilled to watch the drama and still be a little sad because some of the distance has been lost. 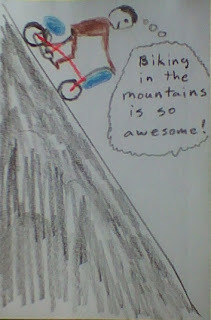 But out there, right now, folks are rolling, baking in the heat, freezing in the snow, trudging or turning the pedals. The effort is heroic. And that will never change. Yeah, the picture is blurry. My life tends to be rough on cameras and I killed another one, so the photos in this report were shot with the junky camera in my little Archos Android device. I had a US Bike Routes meeting in Twisp on Wednesday afternoon with some of my pals from the Bike Alliance of Washington and had to be back in Issaquah for my real (paying) job by 10:00 AM Friday. Barb, Louise and Andy were headed to Spokane after the Twisp meeting, so while I'd hitched a ride with them to get to Twisp, my plan for getting back to Issaquah involved pedaling my little Dahon for 214 miles. This is not a course of action I'd recommend to most people, but I have a background in randonneuring and doing other stupid long rides, so the idea made perfect sense to me. Fueled by baked goods from the Cinnamon Twisp, I rode part way back Wednesday evening. I saw lots of deer in the Methow Valley and at 8:40 PM I pulled into the campground at Early Winters. 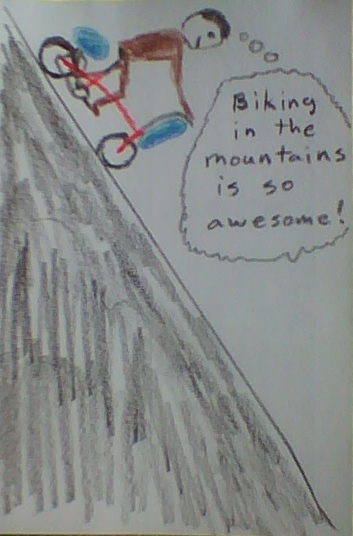 I was also thinking that those little wheels spin quite fast on the descent and I worried some about overheating the brakes. I took some more blurry pictures. I ate a bunch of food. I rode against headwinds. I saw lots of bike tourists going the other way. By the time I got to Lake Stevens it was raining pretty hard but that's what raingear is for. This year's Tour Divide Race has the largest number of racers ever and epic snow levels lead to the decision to allow the racers to follow an alternate route, bypassing the snow-choked passes of the Flathead Region. All racers but one, speeding southward, chose the Fernie Alternate Route, bypassing the Flathead Region. The one exception, Justin Simoni from Denver Colorado, is taking the long way, the hard way through the snow. I know that Justin did not make this decision lightly or accidentally. What some may regard as foolhardy I can only regard as epic, honest and admirable. 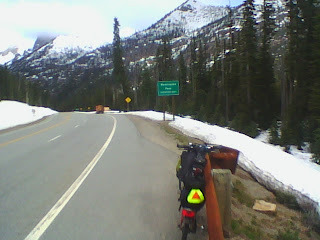 As of this writing Justin has made it about a third of the way through the Flathead Wilderness. Around midnight, he made it to the Butts Forest Service Cabin. This morning he is moving onward. Signals reach out via the Spot Tracker and satellites to tell us of Justin's motion. Where he is now he cannot receive such technical reassurances from those of us who track him. He has the land, his gear, his wits and his resolve. And though I've never met Justin, I believe that these things will be enough to carry him past the drifts, doubt and difficulty. Because he chose the long way, the hard way. Godspeed to all the racers, but I have to confess, I have a favorite now. His name is Justin Simoni. He is taking the long way, through the snow. 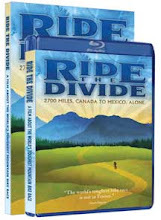 The 2011 Tour Divide starts on June 10th from Banff, Alberta. Good luck to all the racers. As always, it's going to be one heck of a race. Follow the riders via Spot by clicking [HERE]. Hear the racer call-ins at MTBcast.com [HERE]. Back before I managed to work my life around to this point where I make a modest living doing various things with bicycles, I kept a roof over my head and food on the table in the world of computer software. In the early days I wrote a lot of code that made little dots form the patterns that people wanted on computer screens but as the projects and companies grew my jobs and titles would morph. I found myself spending more time in meetings and less time writing code, more time with people and less time with machines. Instead of being the compiler guy or the guy writing the AI & animation routines, I became the guy with an office instead of a cube. At one place I was a "Technical Producer", while I was "Director of Development" at another and "Manager of Quality Assurance" at a third. When asked what I do I'd honestly say "I send a lot of email and I go to a lot of meetings. When the phone rings I answer it." If pressed for time, I'd just say I was a manager. Back in 1994, I was at the bookstore at the University of Washington to hear Allen Ginsberg read some of his poems. After the reading I went up to Allen to have him sign a copy of one of his books. He asked me my name and I told him. And then he said, "So, Kent, what do you do?" I told him I was a manager. "Hmm," he said, "so people do what you tell them to do?" "No," I replied, "that never works. I tell them stories. I ask them questions. We try to find things that are wrong and make them a little less wrong." Allen's wise eyes twinkled behind his round owl glasses as he spoke with a kindness I'll never forget, "sounds like you're a very good manager." I'm not sure Allen was the best judge of business and I know there are some folks I've worked with who could have benefited from more direction than I was willing to provide but every now and then I hear from people I worked with years ago and what they remember are the stories, the questions and the fun we had finding our way. Various of my friends from my days working in software have contributed to Team Turtle. The latest of these is Bjorn Simpson who not only donated to the Arthritis Foundation, he gave me permission to share this note, his blog and pictures of his own inspirational trip down the Pacific Coast. The things we do and the stories we tell matter. Thanks to Bjorn and all the Team Turtle supporters. It's a beautiful world, Bjorn has the pictures to prove it. I saw your blog post about the upcoming People's Coast Classic ride benefiting the Arthritis Foundation and figured I'd throw in a modicum of support. 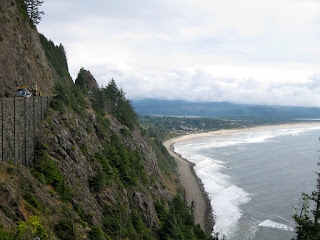 I rode those roads just last fall, and was awed and overjoyed to be there on a bicycle. I don't know if you know that you were something of an inspiration to me in getting back on my bicycle in the first place, and in the evolution of my general bicycle worldview, which is basically a wholesale theft of your "any distance is cycling distance" mantra. Cycling has become something of a defining element for me, and when friends ask about it I often have to begin "Well, I once had this boss named Kent…"
After a few years of becoming more and more of a bicycle guy (I remember seeing you several times, years ago now on our morning commutes, as I commuted to Bellevue and you to Seattle, though I'm not sure you ever recognized me), last September I took a month-long, 2000-ish mile solo self-supported ride down the west coast to the Mexican border. It was one of the best things I've ever done in my life. It was non-stop joy. Enjoy your own adventure along the coast, and have a great ride! Be Brave, Be Strong is a book filled with pain, doubt, anger and angst. It also contains wonderful descriptions, breathtaking beauty and relentless determination. It is Jill Homer's story of her experiences leading up to and racing the 2009 Tour Divide, a 2740 mile mountain bike race from Banff, Alberta to the US/Mexican border. It's a hell of a ride and a hell of a read. Those familiar with Jill's popular blog or who have followed the Tour Divide online may think they know the story contained in Be Brave, Be Strong, but the book casts this huge undertaking in the most personal of terms. Jill tells the tale as only she can, through her eyes and experiences. And she's not afraid to make herself look bad. She judges people harshly, faulting person A for being too helpful and person B for doing to little and she stews over this person being too talkative while another is too distant. With the Divide as grand backdrop she pedals and slogs through snow and mud and isolation even when she is unsure of what she's ultimately seeking. Those looking to Be Brave, Be Strong for practical advice on Divide racing will probably be disappointed, although it does contain some great advice on the use of wax-covered cheese wheels and Sour Patch Kids as race fuel. And ultimately the distance and time and mud overwhelm even the most obsessive self-examination and critique and at the end of the trail perhaps we find that the trail is just beginning.